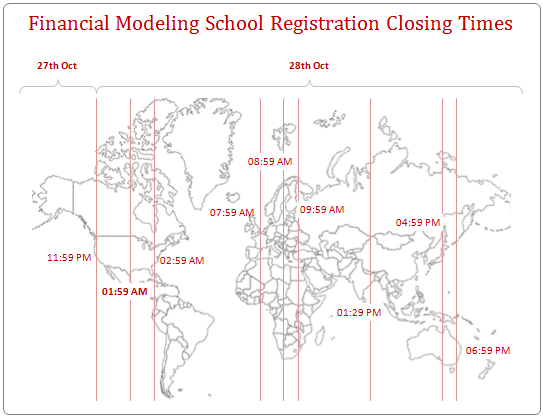 At the time of writing this post (around 8 AM Indian time on 27th), we have 85 students signed up for Financial Modeling School. My partners at Pristine and I are very excited to see so many eager students in our first batch. But we are also keen to help as many of you as possible, because we like to make financial modeling rock stars. Our initial plan is to sell the course at $297 and offer $100 discount to first 100 students. But we have decided to offer the discount for all students in first batch. So, the course fee will be $197 for Download option & $147 for Online option. Get full details & sign-up. 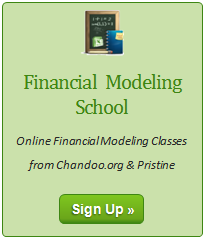 When do re-open Financial Modeling School? We will not be re-opening financial modeling school this year. It will take us 3 months to finish this session. So we will be re-opening registrations in February 2011. Do you see the awesome world graph above with closing times? Well, it is made using Excel. I have first done it during Excel School 3 and now I just modified it for Financial Modeling School. Click here to download the chart template & use it for an upcoming event or project.